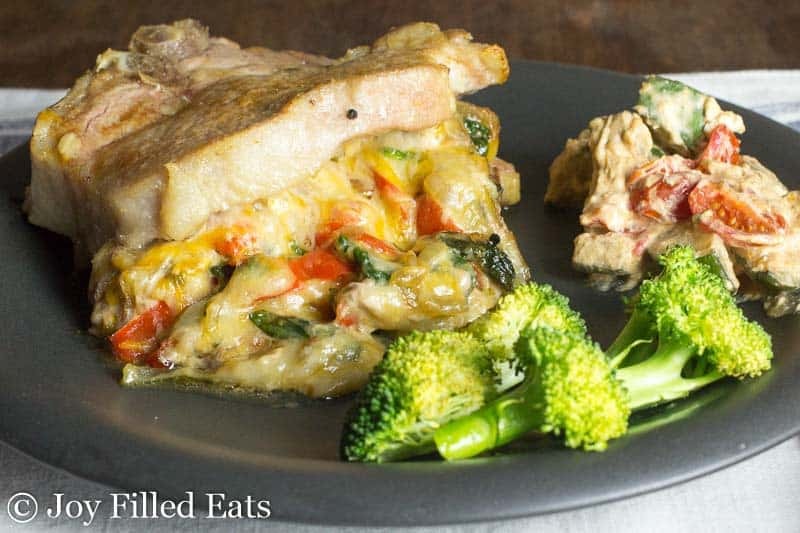 These Cheesy Spinach Stuffed Pork Chops with Peppers & Onions are perfect for Valentine’s Day at home or any other special night with your sweetie. Why pay premium restaurant prices when you can create a delicious restaurant quality meal in minutes? It’s been many years since my husband and I actually went out to dinner on Valentine’s Day. I decided I’d rather cook us a delicious meal at home then spend extra money on special holiday type menus February 14th. We try to get out to dinner at least once a month to have some time together without being interrupted by our 4 kids but I’m just as happy to go out any other night in February. 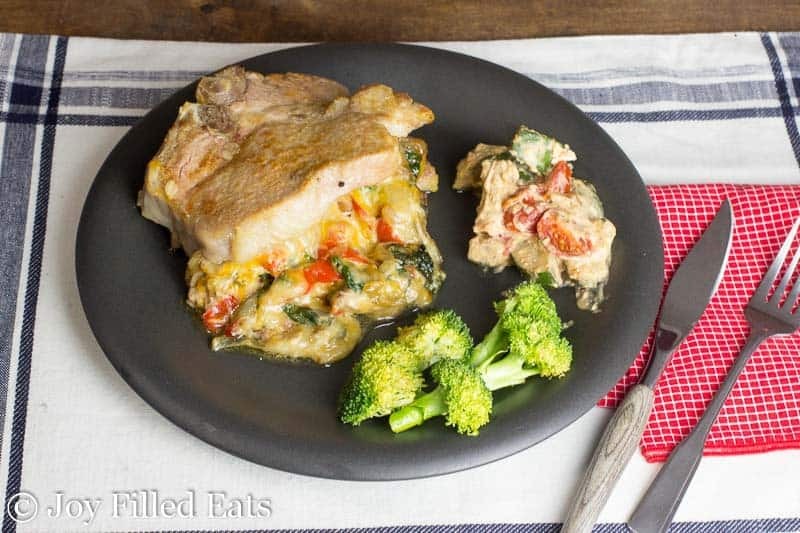 We had our home Valentine’s date night a little early this year so I could share this fantastic recipe for stuffed baked bone-in pork chops with you. It was so good I think I’m going to make it again next week. 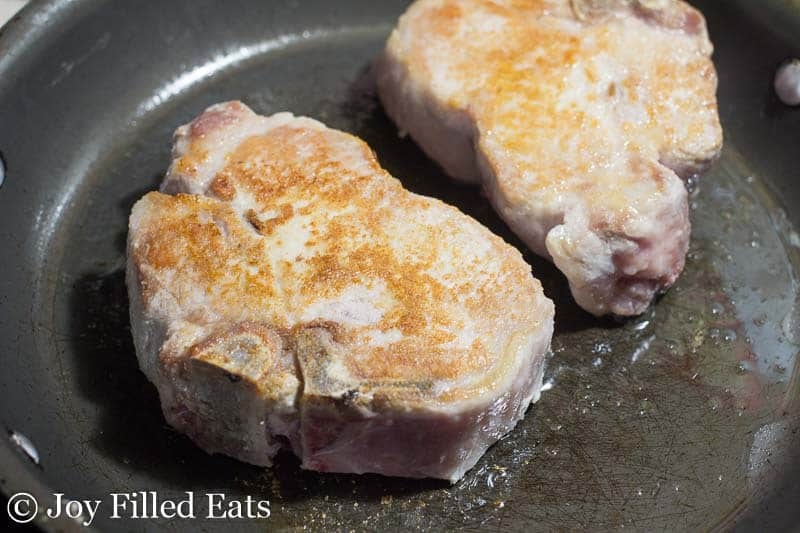 I decided to use Smithfield® Prime Fresh Pork Bone In Chops because they are a product of the USA, have no added hormones or steroids, and are naturally gluten-free. Not all pork is created equal. My husband kept commenting on how tender these chops were. Now *that* is a pork chop. 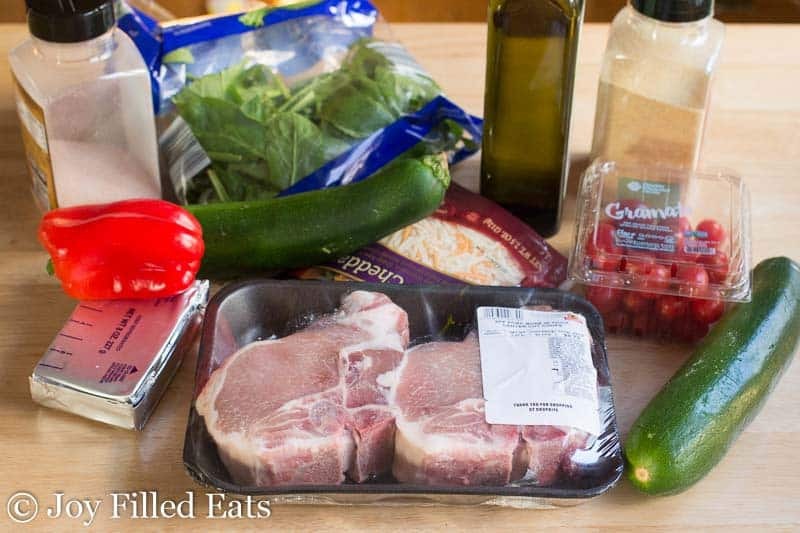 I purchased these amazing Smithfield Prime Fresh Pork Bone In Chops for at my baked stuffed pork chops at my local ShopRite. 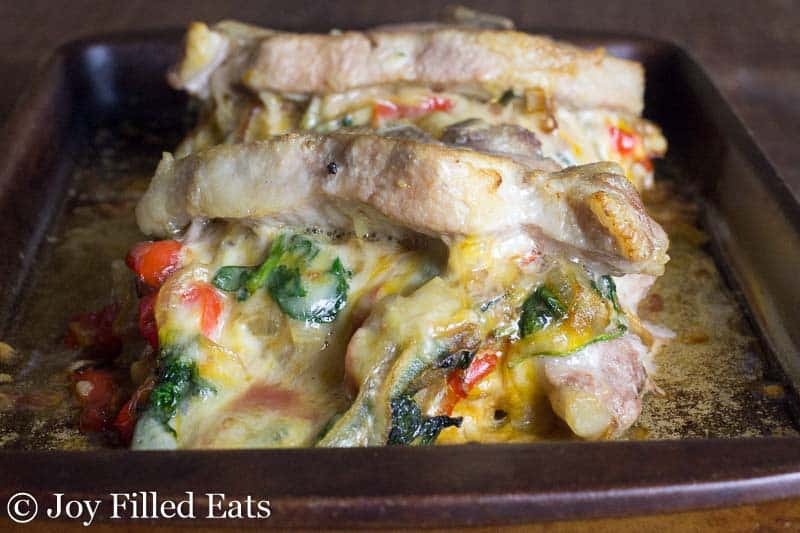 For more recipe ideas visit the Smithfield website. This recipe is very simple. First, you brown the pork chops. 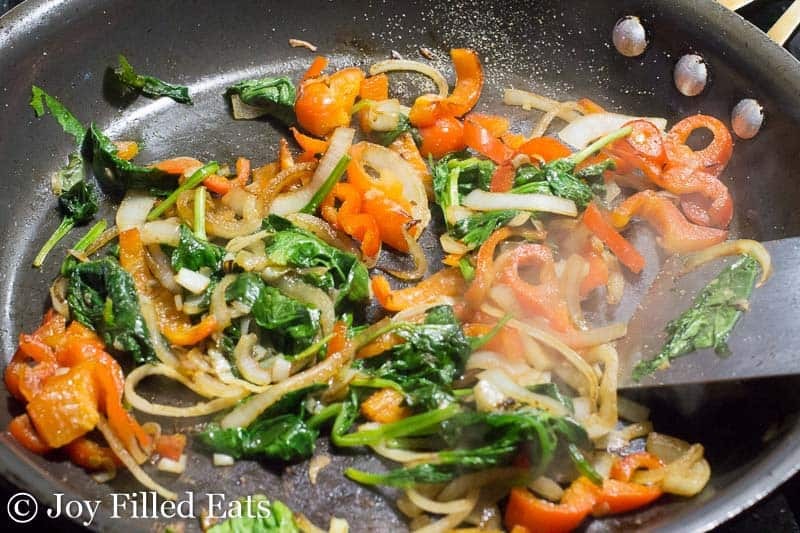 Then you saute the veggies. Cut a slit most of the way through the chops and stuff the veggies and cheese inside. 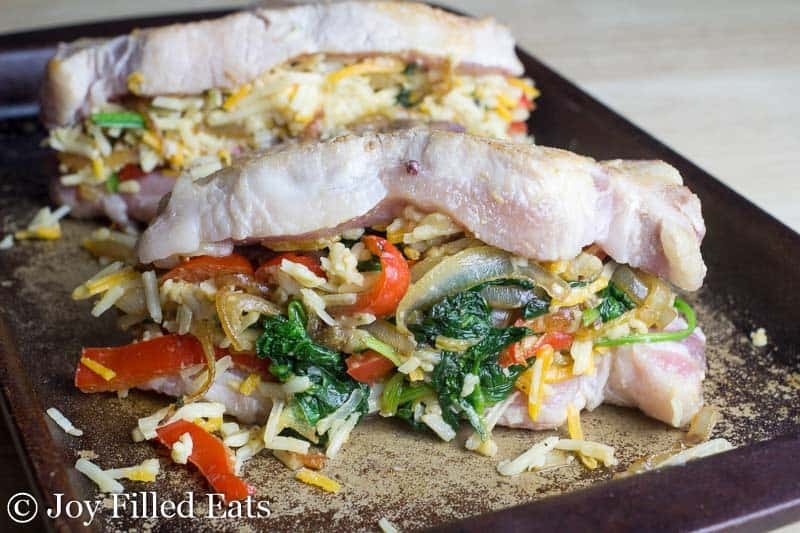 Bake the spinach stuffed pork chops in the oven until cooked through. Restaurant quality in your home kitchen for a fraction of the price. 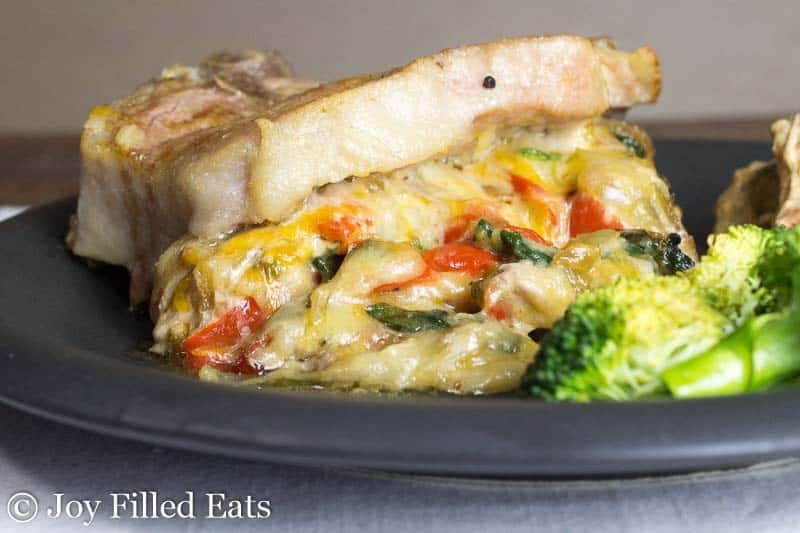 I served these Cheesy Spinach Stuffed Pork Chops with Peppers & Onions with steamed broccoli and I sauteed some zucchini and tomatoes with a little bit of cream cheese. Yum! 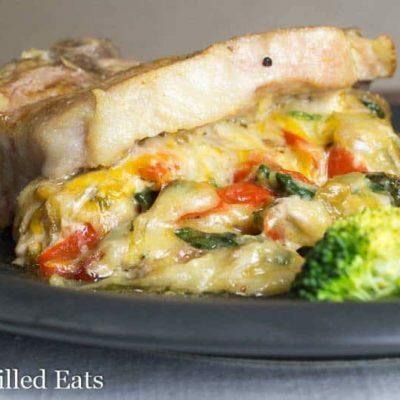 These Cheesy Spinach Stuffed Pork Chops with Peppers & Onions are perfect for Valentine's Day at home or any other special night with your sweetie. 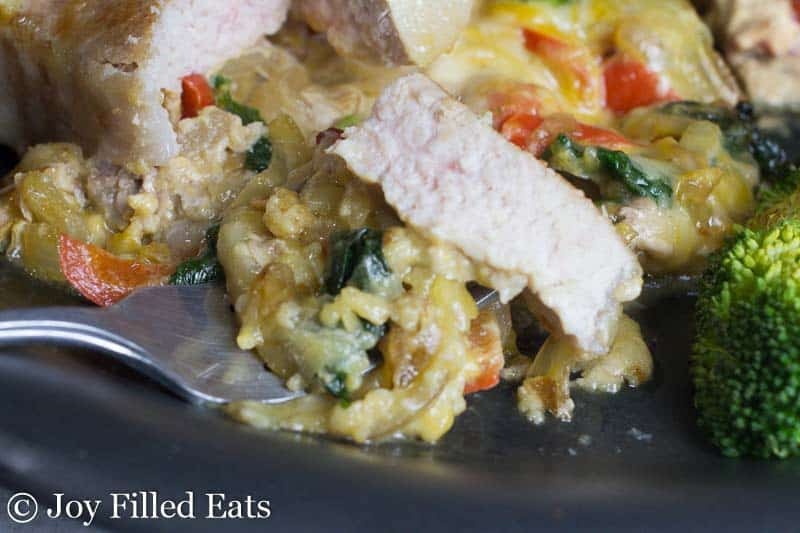 Why pay premium restaurant prices when you can create a delicious restaurant quality meal in minutes? Preheat oven to 350. Preheat a large frying pan over medium-high heat. Drizzle the cooking oil in the frying pan. Sprinkle 1 tsp of the garlic powder and 1/2 tsp of salt on the pork chops. Rub it in on both sides. Sear the pork chops in the hot frying pan. Transfer to a baking sheet. Add the peppers and onions to the frying pan. Cook until softened. Add the spinach and cook until wilted. Add the other 1/2 tsp garlic powder and 1/4 tsp salt. Cool for 5 minutes. In a medium bowl mix the cooked veggies and the shredded cheese. 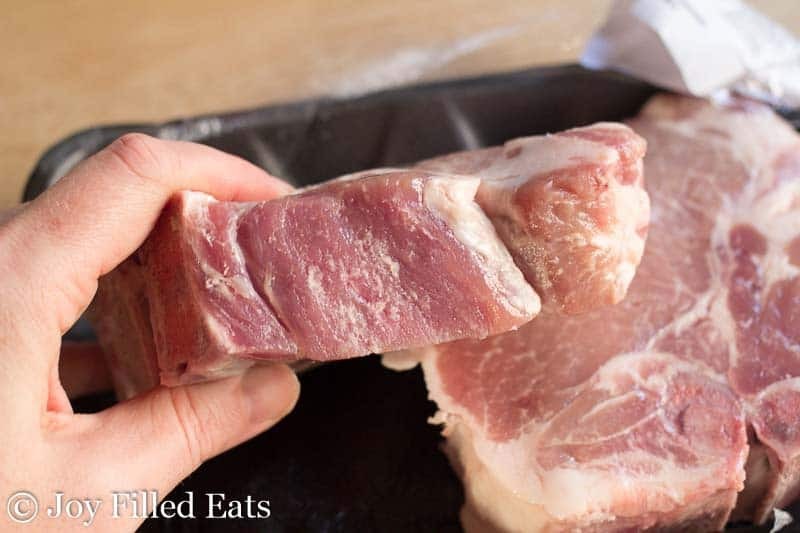 Cut a slit in the pork chops until you hit the bone. Stuff with the cheese and vegetable mixture. Put in the preheated oven. Cook for 30-35 minutes or until the pork reaches 160 on a meat thermometer. 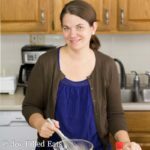 For recipe inspiration be sure to go here! Let me know in the comments what you’ll be making for Valentine’s Day dinner! I’d love to hear your ideas.